Sheet masks are always a nice way to use a mask with little fuss or effort but sometimes the wet and cold slimy product from these, dripping down your neck can be a little off putting. Sam in particular hates using sheet masks because she can’t bear the wet texture over her throat. This week we have been testing out the dry sheet mask from Trish McEvoy. It’s a total revelation! I wasn’t sure how effective it would be, seeing as it just feels like a soft paper towel laid over your face. We are so used to being able to feel the texture of the ingredients that it seemed slightly odd to apply something completely dry with no detectable product. The mask is quite large but it has loops at the edges so that you can loop it over your ears, making the mask sit tightly onto the face. The mask feels very soft to the touch and is activated by the heat from your skin. Initially you need to apply it and then massage the face gently over the top. After a few minutes you can feel comforting warmth coming from the mask. Like having a heat pad over your face. There is no sting, no tingling just a little heat, which, is purely from the mask rather than your actual skin. The ingredients within are in their most concentrated dry form and contain Hyaluronic acid, peptides and antioxidants. The first time in a long time I can honestly say the results were actually visible instantly. The heat had given my skin the kind of glow you get after 20 minutes in a steam room. This meant that my skin was flushed, plumped and softened. My pores were refined and my skin appeared simply awakened. The great thing about this mask also is that you can get three uses out of it when you use it on clean skin. You just fold it up and pop it back in the re-sealable packet. You can also lay it over a made up face, as it won’t disturb your makeup. I haven’t used it in this way yet but I imagine it would be awesome over the top of your bridal makeup 30 minutes before you leave the house and head up the aisle (don’t forget to take it off!). Also nice to use before a big night out whilst you are waiting for your taxi. If you use it over makeup, you can only use it once though. 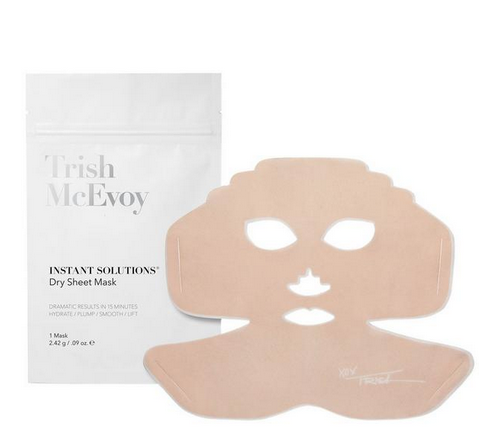 The Trish McEvoy Dry sheet mask is £22.00 and available here. I love the sound of instant results! This sounds fabulous. i love the sound of this!! You could use it over makeup on the third and final use! !